The 900-tonne block of steel that will form the stern of Britain's new polar ship is being moved into position at Cammell Laird on Merseyside. The Birkenhead yard received the rear section of the Sir David Attenborough on a sea-barge at the weekend from Northeast subcontractor A&P Tyne. Multi-wheeled trailers are now shifting the block from the quayside up to Cammell Laird's big construction hall. Attachment to the rest of the hull will take place in the next couple of weeks. The aim is to have the finished ship ready to start trials by autumn next year. Linton Roberts is the managing director at Cammell Laird. He told BBC News that assembly of the £200m vessel was moving at pace and on schedule. "We've got about 85% of the ship's structure in fabrication at the moment, and each of the blocks being assembled on the slipway area are very much being outfitted now. And by outfit, we mean pipework, machinery, and cableways. So it's a very busy time." The 128m-long RRS Sir David Attenborough has been commissioned to replace the UK's existing polar fleet - the RRS James Clark Ross and the RRS Ernest Shackleton. The new vessel will support British scientists working in the Antarctic and the Arctic. It will feature a big cargo hold, a helipad, cranes and onboard labs, and have the ability to deploy subs and other ocean survey and sampling gear. Some of this equipment will go into the sea through an enclosed "moon pool". This feature - essentially a huge hole right through the middle of the hull - is clear to see for anyone walking across the growing mass of steel decks at Birkenhead. Another very visible sign of progress are the giant Rolls-Royce diesel engines. There are four of them and they have all been mounted on their seats. Two are resting on a double "raft" system inside the hull. This will allow them to run with minimal noise disruption to the wider environment - an essential capability for the Attenborough to conduct sensitive science experiments in polar waters. Once all items of auxiliary equipment are positioned in their respective blocks, the deck sections above can go on. The next in line are ready and waiting. "Sequencing is very important," said project director John Drummond. "You can't just build the shell of a ship and then outfit it. Everything that doesn't go through a door has to be inside before you put the lid on. We don't want to be cutting holes in the side of a brand new ship." Behind the diesels are the switchboard rooms that send the engines' electricity to the propulsion motors that drive the propeller shafts. Segments of those shafts are present and ready to be threaded through A&P Tyne's stern section. Referred to in the build as Block 10, this steel mass is the equivalent weight of 71 London double-decker buses. As well as those propeller shafts, it will also hold the steering gear and rudders. Block 10 is being rolled up to the construction hall to be welded to the rear of the Birkenhead-produced blocks. When that is done, the hull structure will be more than 100m in length. The next move is to edge this whole edifice down the slipway a short way to create room at the front to attach the ice-breaking bow - so-called Block 40. Currently, this section is minus its exterior shell plates and flipped 180 degrees to give Cammell Laird's engineers easy access to the internal framework. "You can see from the framing of the steelwork at the bow that it's a lot closer together," explained Mr Drummond. "As the whole of the hull is pushed together at this point, it has a lot of very thick welds, much thicker than in the rest of the ship - because obviously it takes a lot more pounding from the ice. The vessel actually rolls on the ice to break through; it doesn't cut through it like a knife." The required specification is to break sea-ice that is 1.5m thick. It was only in October last year that the BBC broadcaster and naturalist Sir David Attenborough kicked off the formal construction of the vessel that will bear his name. 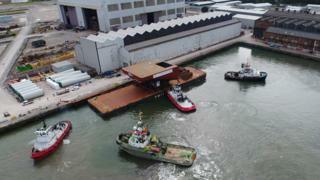 This involved the ceremonial laying of an initial hull block on the big hall's slipway. If timelines are maintained Cammell Laird should have the ship in a launch position on that slipway in the spring of next year. The first full science expeditions using the Attenborough are expected to be conducted by the Natural Environment Research Council-funded British Antarctic Survey in 2019. Mr Roberts said the ship would come back to Birkenhead for periodic inspections and re-fits. He expects the yard and the Attenborough to have a long relationship. "This is a very capable ship," he told BBC News. "For example, it will have aviation capability in the form of helicopters and drones. But it's a very flexible platform and I think when the scientists start using it in ways that no-one imagined, they'll be back to have modifications made, and the design certainly allows us to do that."